During the summer in Santa Fe there is so much of national interest going on in the Art World that one week alone I found a review of the performance of the opera, King Roger by the Polish composer Karol Szymanowski in the New York Times and another review of a contemporary show, “Art in the Age of Truthiness” at Site Santa Fe (our Kunst Halle) in Time Magazine. Here we find three different Art Worlds. There is the contemporary art scene, the Native American field and traditional local Hispanic arts, whose annual “Spanish Market” takes over the center of town the last week-end in July. The traditional art forms that have been developed in the Hispanic communities of New Mexico are retablos (religious painting on panel) bultos (woodcarving of religious figures) tinwork, jewelry and textiles. At Spanish Market opening night, which take place at the convention center, works entered to win awards and honors are exhibited and the prize winners are celebrated. Members of the Spanish Colonial Art Museum are invited to preview the work, meet the artists, and decide who of the hundreds of artists they might most want to visit during the two days of the fair when the artists man their booths on the plaza and their work goes on sale. The Mayor, David Koss, and the Mayor Pro Tem, Rebecca Wurzburger, come especially to honor the artists. Both, I believe, would be there even unofficially because they told me that they really enjoy it and I saw them go around to the individual booths. We returned Sunday morning with an old friend from New York who collects in many fields. One of his main interests is in Mannerist style painting around 1600, mostly Middle European and Flemish and a number of them are painted on panel. I don’t think he was convinced that there would be material of interest to him here, but he soon found out this was not the case. We learned together how knowledgeable many of the artists are about the history of art and the conservation of materials. We did have the advantage that Penelope, the art historian and curator, led us mostly to the best artists in the market. We visited the booth of Gustavo Victor Goler, one of the best Santeros (literally Saint Makers). I love his interpretations of traditional subjects and he offers his own updating to the saints. One such is a bulto (a santo carved in the round) of Saint Lucia (283-304) who had her eyes gouged out before her martyrdom so she became the patron Saint of the blind. Traditionally she is portrayed with her eyes on a platter, here she has a pair of glasses. Because of Goler’s work in wood and having clients all over the country he has learned about how to take care of the material in this very arid climate. He is also a conservator who restored the historic collection of bultos in the New Mexico Museum of History. He was able to discuss with Joel methods for protecting his European panel paintings should he decide to bring them to Santa Fe. Spanish Market exists in two sections, the main one is the traditional market which takes its lead from the original rules and is very slow to change. The other is the Contemporary Spanish Market. 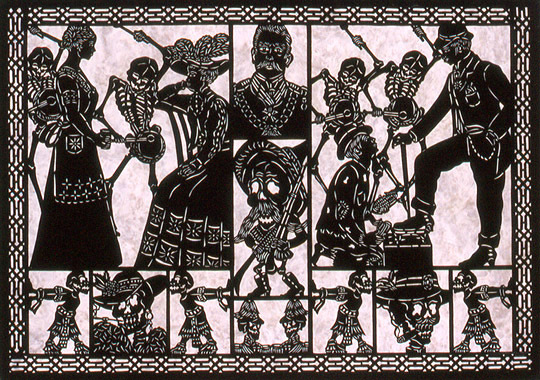 Here we found a paper cutting artist, Catalina Delgado Trunk, whose art form can be traced back to the 6th century, but it is a Mexican not a New Mexican tradition, so it does not fall within the traditional market’s categories. She has taught, published and had curatorial experience and she ended up discussing Holbein with our friend! Just because artists are in Contemporary Market does not mean they are unaware of art history. As any regular readers of my Missives knows, we collect Native American art and we have bought little in the way of Hispanic art though we have a number of pieces of good WPA furniture by Hispanic artists. We have, however, purchased small contemporary pieces such as tin switch plates, calling card holder and frames. This time we ended up with a far more serious object, a mirror, not with a tinwork frame but a wood carved one by Andrew Garcia. It has roots in the artistic history of New Mexico in that the birds are adapted from carved pieces by Nicolai Fechin, a Russian émigré painter who after the Bolshevik revolution settled in Taos, New Mexico. Also, the chiseled surface of the wood goes back to a style used by Jesse Nussbaum who was responsible for much of the 1917 art museum and its furniture here. Penelope has been working recently on furniture made in New Mexico at the beginning of the twentieth century so she saw her name written on this mirror. It did not hurt that Garcia won first prize for furniture, or that the Spanish Colonial Museum here had selected Garcia as the poster artist for this year’s Market, illustrating a piece the Museum had purchased at Market last year. Spanish Market proved, once again, that there are still masters to be found in traditions that remain alive.